Sunday October 20th 2013 was shaping up to be a scorcher in western Sydney so I headed off early for the Camden Car Show. 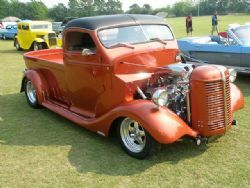 This annual event is hosted by the 55-56-57 Chevrolet Club of Australia and welcomes all classics, customs, old school, street rods, hot rods, bikes and commercials. I haven’t been for a few years so I was interested to check out the range of shoebox Chevs and the other classics present. It takes a good hour and half to get to Camden from the northern beaches so by the time I arrived I was in desperate need of a frothy coffee and breakfast. Sitting outside Back Gallery Café on the main drag not only satiated my need for refueling but I was able to watch all the classics drive past on the way to the show. Held in the show grounds the turn up was good considering there were five other events in around Sydney on the day. 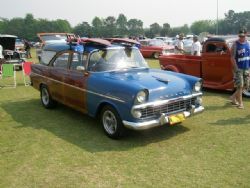 Numerous clubs were present and most marques were represented with the quality of cars impressive. On offer are some of the coolest trophies I have seen but with stiff competition on the oval you would need to be driving something very special to leave with one. I left before the presentation as the temperature was rising and I had other commitments to attend to. This year there were more rods than the last time I came, a top shelf selection of tri-fives, quite a few Mustangs, Fords, ratters, a smattering of Mopars and to top it off a number of vintage and veterans as well. There were only a few custom bikes and they were all outstanding. You’ll see from the pictures the old EK wagon took my fancy with a faux woody treatment. 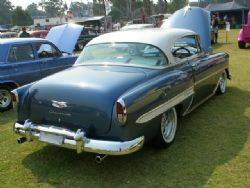 The 54 Chev was immaculate and the interior was superbly done with a tricked up dash monitoring all the vitals under the hood and a steering wheel complete with audio and cruise controls. Very nice. 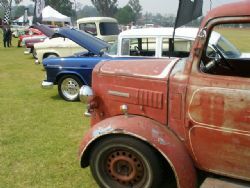 If I had a chance to take one home the 46 Bedford ute would get my vote on the day. The quality of this custom creation would stand up against anything and it was presented in pristine condition. I suspect it may have plenty of mojo judging by the highly detailed donk and it wasn’t short of creature comforts on the inside either. All in all well worth the drive and in keeping with the last few events I’ve been to I would not want to be a judge and have to pick the winners. If you missed it this year or haven’t been for a while be sure to put the Camden Car Show in your diary for next October.